Hello! Welcome to a new series called Swiss Cities in Depth. I'm interested in highlighting some of the great places Switzerland has to offer by featuring some of its cities here on the Adventures at Franklin blog. Since the majority of the country is accessible within several hours by train, these cities are also excellent to visit for a day or a weekend. I thought that the best way to begin would be by writing about the city that Franklin calls home — Lugano. Technically, Franklin is located within a Comune (municipality) called Sorengo. However, Sorengo lies within the metropolitan area of Lugano, the largest city in Canton Ticino. 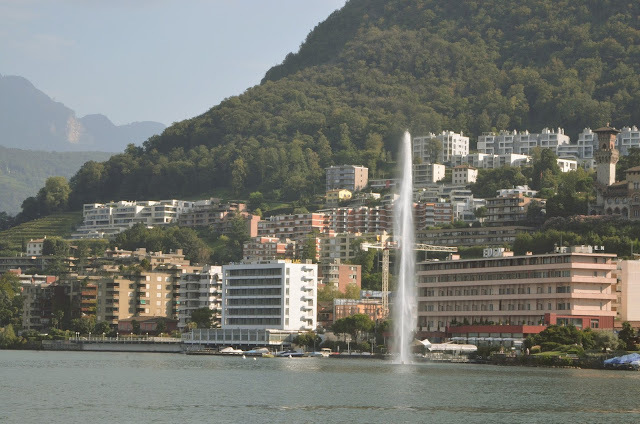 Geneva isn't the only city with a "Jet d'Eau" - Lake Lugano has one too. Ours is located in Paradiso, another Luganese municipality. Lugano has existed, albeit in a less developed form, for over 1000 years. 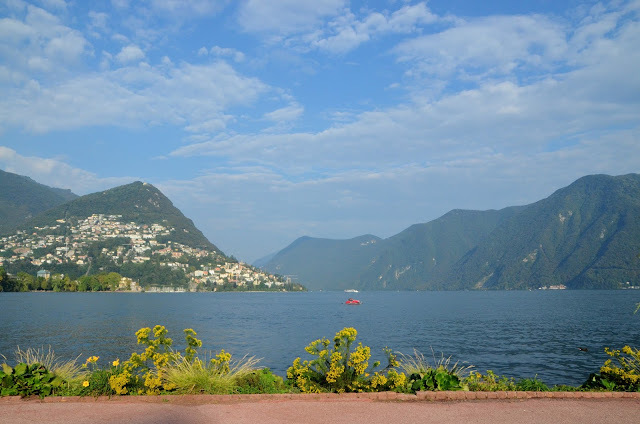 There is proof the area was inhabited dating back at least to the 10th century, and artifacts discovered have shown that the shores of Lake Lugano have been inhabited for far longer than that. As with the rest of the territory south of the Gotthard that now comprises the region of Ticino, continual disputes over the rightful proprietors took place for several centuries — especially between the municipalities of Como and Milan in nearby Italy. In 1513, a period of peace and relative prosperity began when Lugano became a Swiss dominion, and it was nearly 300 years later that it became a true part of the Swiss Confederation. The population of Lugano soon began to expand rapidly, owing much of its growth to the opening of the San Gottardo railway, which enabled easier access to Ticino from the rest of Switzerland. After that, the rest is history — the city became a cultural center and a touristic hotspot. The LAC, a center for art and culture in Lugano, is located next to the lake and is dedicated to visual and performing arts. Nowadays, Lugano is best known for its mild climate, beautiful scenery, cultural and outdoor activities, and for its role in Switzerland’s banking sector (Lugano is the third financial center of Switzerland, after Zurich and Geneva). Although it is not the capital city of Ticino, the Luganese district has the highest population in the Canton. Additionally, it is comprised of 59 municipalities that are divided into 12 groups. 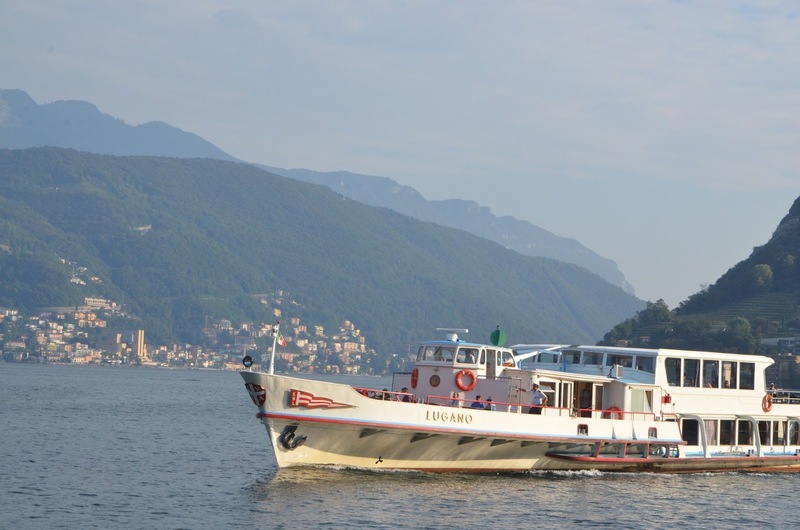 Boating and sailing are extremely popular activities in Lugano. When I think of Lugano, I always picture the vivid colors that are found here, especially during the summer. I love the way that the greenery contrasts with the intense blue of the lake and the colorful buildings clustered along the shore. The lakeside promenade is lined with benches, encouraging passersby to stop and admire the view. 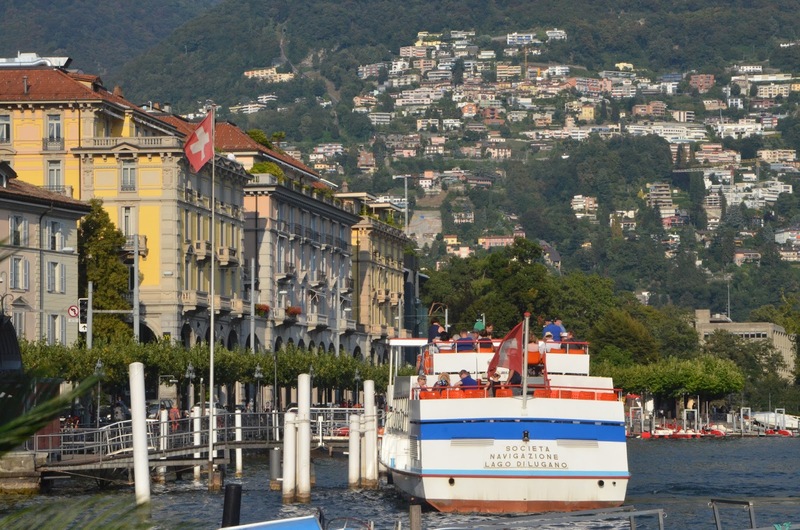 Although the Italian-speaking Swiss refer to Lake Lugano as Lago di Lugano, those on the Italian side of the border often refer to it by the name Ceresio instead. Lugano features many structures that have been around for centuries. One example is the Chiesa di San Carlo Borromeo, a church that was constructed in the mid-seventeenth century. It is located on one of the most expensive shopping streets in Lugano, Via Nassa (and it precedes all of the exclusive boutiques). I wrote a paper about Chiesa di San Carlo Borromeo during my freshman year at Franklin. Lugano is one of the sunniest cities in Switzerland. In fact, Canton Ticino experiences more annual sunshine than any other Canton. The highest mountain by Lake Lugano is Monte Generoso, at approximately 1700 meters in elevation. Well-known author and novelist Herman Hesse, who received a Nobel prize in Literature, spent many years in the Lugano area. 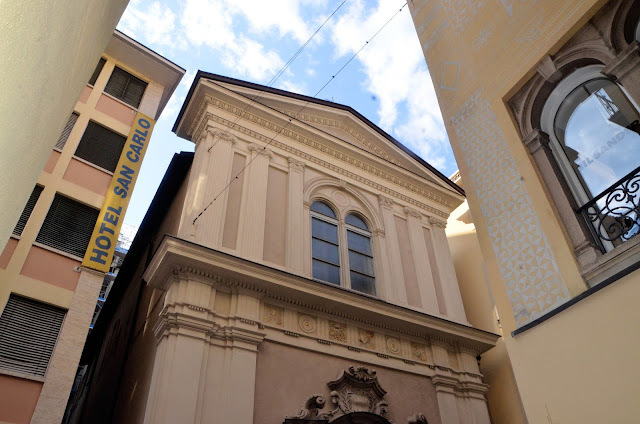 You can visit his home-turned-museum in Montagnola, approximately 15 minutes from Lugano's city center and just up the road from the Franklin campus. Many locals (and Franklin students!) like to cross the border to purchase groceries in Italy, where certain goods are cheaper. A small regional train directly connects Lugano with Ponte Tresa, a town straddling the Swiss-Italian border. A quarter of the Ticinese Gross Domestic Product is produced in Lugano, the 9th largest Swiss city. The 1956 Eurovision Song Contest (the first ever!) was held in Lugano. The contest lasted less than two hours and featured performances by seven different countries. Well, that's it for today! Hopefully you learned something new about this beautiful city. If you have any questions, comments, or have an idea about content you would like to see in the future, please let me know below this post as I would love to hear from you. P.S. 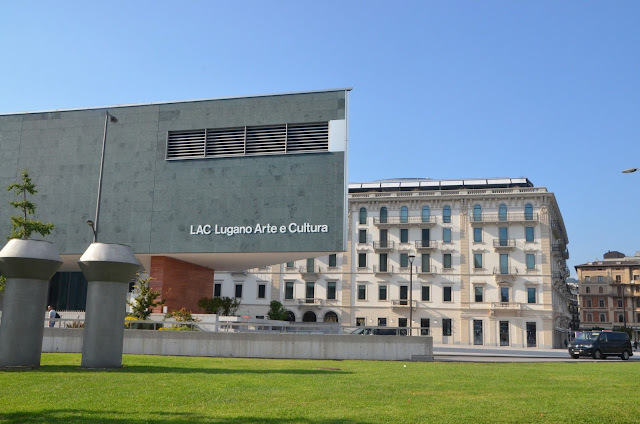 If you are interested in more brief information about Lugano and its history, please see the links here and here.